Born in Foggia, in 2000 he obtained his diploma in piano at the "Umberto Giordano" Music Conservatory in Foggia with highest honors under the guidance of A. Drago. In 1999 he won a scholarship sponsored by the Conservatory, through which he took part to a masterclass given by Alexander Lonquich in Rhodes Garganico and held during the "Gargano festival”, in which he performed at final concert. It was also selected by the Director of the Conservatory for the initiative "I Conservatori si Incontrano" in which the best students from italian Conservatories performed in others Italian Conservatories. He continued to study for several years with Professor Pasquale Iannone and attended many seminars and courses in piano technique and interpretation with the following Professors: M. Mollova, (Sofia, Bulgaria), F.J. Thiollier (Scuola del Trio di Trieste) A. Lonquich (Garganico Rhodes), M. Matarrese (Bari and Lucera). 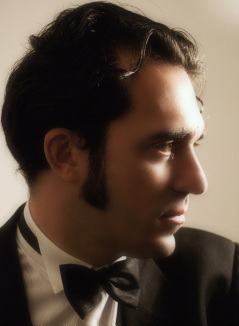 From 2008 to 2010, he won awards in more than 35 national and international music and piano competitions: Caramanico Terme "Paolo Barrasso" 2008 (1st absolute prize with 100/100 and winner of international competition), "Prix Ars Nova" 2008 in Teramo (1st absolute prize with 100/100 and winner of international competition), “V.Bellini” 2008 in Gragnano (1st absolute prize competition), Massafra International Music Competition "Valeria Martina" 2007 (1st prize), Pontedera - International Music Competition "Toscana Classica" 2008 (2nd prize), etc.. He was also on the podium at the International Piano Competition "Citta' di Cercola" (2nd prize – 1st prize not awarded), International Piano Competition "Rossomandi" in Bovino (3rd Prize - 1st and 2nd prize not awarded) and at the International Piano Competitions "Citta 'di Valentino" (2nd prize), "Citta' di Fasano” (2nd prize)," Ernesto Falla in Candelo (3rd prize) and the Tricase International Music Competition "La Vallonea" (1st prize), the International Music Competition "Rosa Ponselle” (1st Prize), the National Music Competition “Orfeo Stillo” (1st prize and special prize "Orfeo Stillo" as best pianist in the competition), the International Music Competition "Estro Armonico" in Ladispoli (1st Prize), the National Piano Competition in Magliano Sabina (1st Absolute Prize), the National Piano Competition" Citta' di Guardiagrele " (1st Prize), the European Competition "Luigi Denza (1st absolute Prize), the International Music Competition "M. Grazia Vivaldi" in Montalto Ligure (1st Absolute Prize), the National Music Competition “Terra degli imperiali” (1st Prize), the Pianistic Prize “Cecilia Pisano” (2nd Prize), the International Music Competition "Don Vincenzo Vitti” (2nd Prize), the International Music Competition "Citta 'di Asti" (2nd prize), the Internazional Music Competition "Citta' di Cervo" (2nd Prize) and the International Music Competition in Padova. He has performed at many important festival and concert hall: Suzhou Culture and Arts Centre, Shanghai City Theatre, Tsinghua University (Mongmanwai Concert Hall- Pechino), Beijing University of Astronautics and Aeronautics (Beihang Sunrise Concert Hall), Nanning Theatre, Tianjin Grand Auditorium, New York (New York University - Casa Italiana Zerilli Marimò), London (St Martin in The Fields in the “Pianists of the World Series” as the first and only Italian pianist and St Barnabas Church “Friday Lunchtime Concert” series), Edinburgh (Scotland) Edinburgh Society of Musicians, Scottish Arts Club and St Giles Cathedral, Leon (Spagna) - Auditorio Caja Espana Duero (Closing Concert for Fundacion Eutherpe) and Eutherpe Hall, Ohrid (Macedonia- Festival "Ohrid Te Sakam”), Milan (Puccini Hall and Auditorium Gaber- Società dei Concerti), Milan (Unuversita' popolare), Viterbo State University "La Tuscia",Ravello (Villa Rufolo -Ravello Concert Society), Crotone ( ACAM - Beethoven Society), Roana ("ArteMusica" Association - Easter Concert), Caramanico Terme (“International Festival of Orfento Valley”), Diano Marina(“I Concerti della Rassegna del Golfo 2010”, Rome (“Music Festival of Nations” at the Teatro di Marcello and “Villa Torlonia”), Gorizia ("Gorizia Classica 2010" Season), Forano ("Sabina Music Festival 2010"), Tivoli (“F. Mannelli” Concert Season - Scuderie Estensi), Stresa (Grand Hotel Palace), Trieste (“Tartini” Auditorium ), Teramo (“Santa Maria in Bitetto” Auditorium), Venice (Palazzo Albrizzi), Milan (Circle "A. Volta”, Residence Arzaga, Pio Albergo Trivulzio), Foggia (A.GI.MUS. Association; Telethon Marathon), Bari (“St Fara's Church” Auditorium), Viterbo ("Chelotti” Barracks Officers Club), Lucera ("Paisiello" Concert Hall), Siponto (Basilica of “Santa Maria in Siponto”) Manfredonia (Manfredonia Festival 2009 in the “San Domenico Palace” cloister) and in the 2009 Christmas concert given by Bruno Canino at the theater Perotto, etc..
On 7th February 2011 he made his debut in Milan Conservatory “G. Verdi” in the “Incontri Musicali” Season – “The best young Italian musicians”. After that the President invited him again for the next Season 2012/2013. On 26th August 2011 he made his London debut with a solo piano recital at the prestigious hall "St Martin In the Fields" in the "Pianists Of The World" series. The event attracted attention from all key local, regional and national media. Upcoming engagements include recital in many important concert hall in Italy and abroad: South Africa Tour in 2013 and 2014, USA -Canada Tour in March 2015, Recital at the Paoline Chapel at the Quirinale in Rome broadcasted by Rai-Radio 3, A return-tour in China, recitals in France, Netherlands, UK (St Martin-in-theFields in London), Liszt Memorial Museum in Budapest, Manchester Cathedral, Italy ("Ravello Concert Society", Bologna, Roma, Ostia Theater etc). He gave masterclasses in Thailandia, China, Indonesia and Italy. On June 2013 he made his tour debut in China with a great success according to both critic and public. He recently recorded a cd produced and distributed by "ClassicaViva". He also graduated with full marks in Economics from University in Foggia.